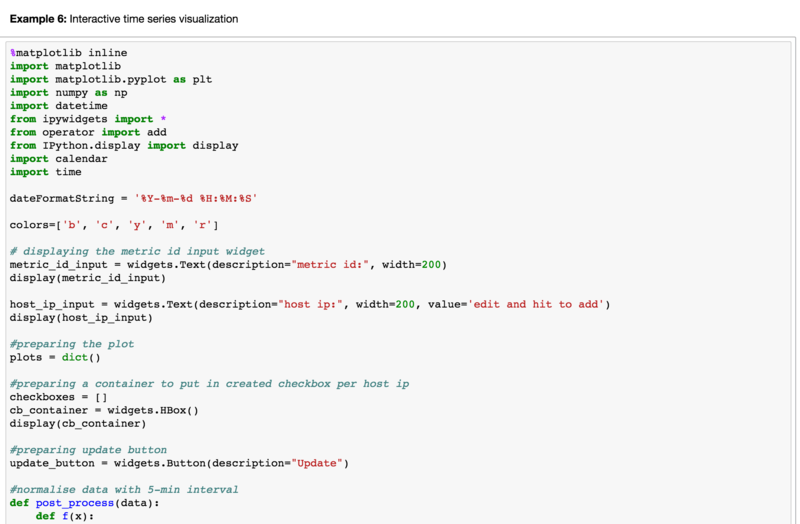 This tutorial demonstrates how to use Jupyter to access data and make sense of data interactively using the Jupyter pyspark interpreter. 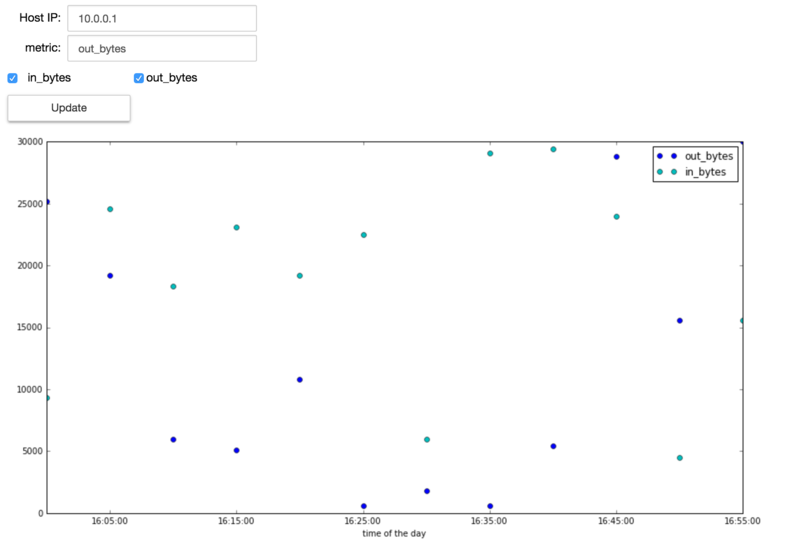 This tutorial uses the PNDA example notebook, where you should be able to find how to connect and upload the example notebook to the Jupyter server on your PNDA cluster. 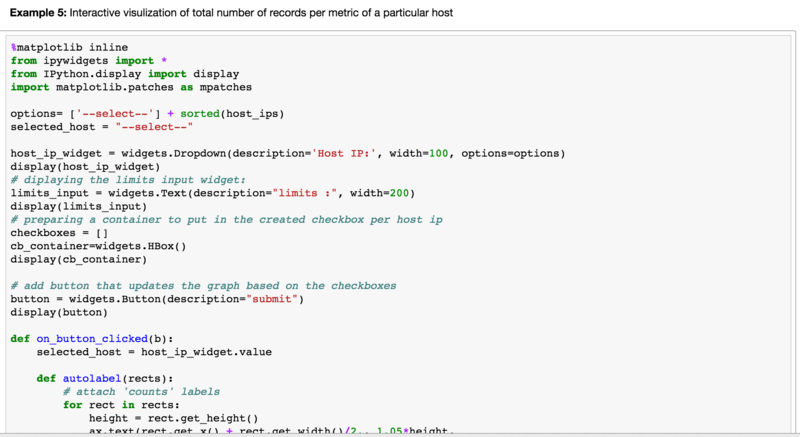 The example notebook consists of four main sections, which gives you step-by-step tutorials on how to use Jupyter and PNDA platform for interactive data explorations. Each section contains one or more example codes/cells. These examples should be executable, but make sure you run them in sequence. Challenges are also provided for you to play. You can find answers at the end of this tutorial. This first thing you will need for this tutorial is having access to sample PNDA datasets. 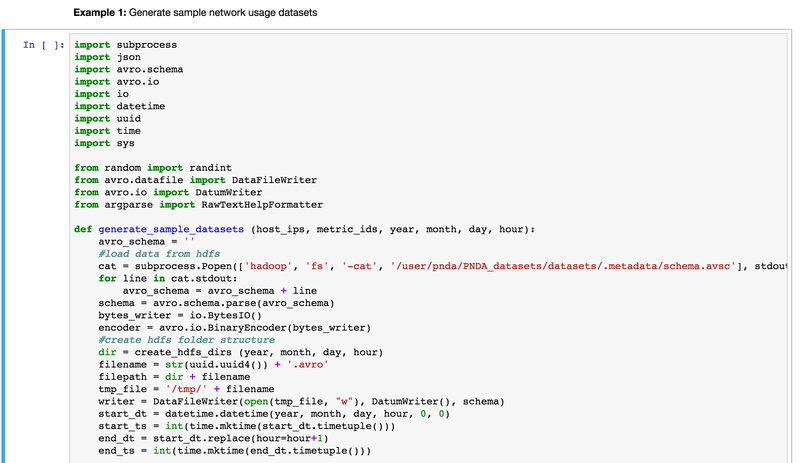 If you don&apos;t have existed datasets, you can generate test sample datasets using data generator tool, which is deployed on Jupyter node automatically when launching a PNDA cluster. Below is example commands to generate example network usage datasets. On success, you should be able to see dataset file is saved in HDFS with absolute file path printed. 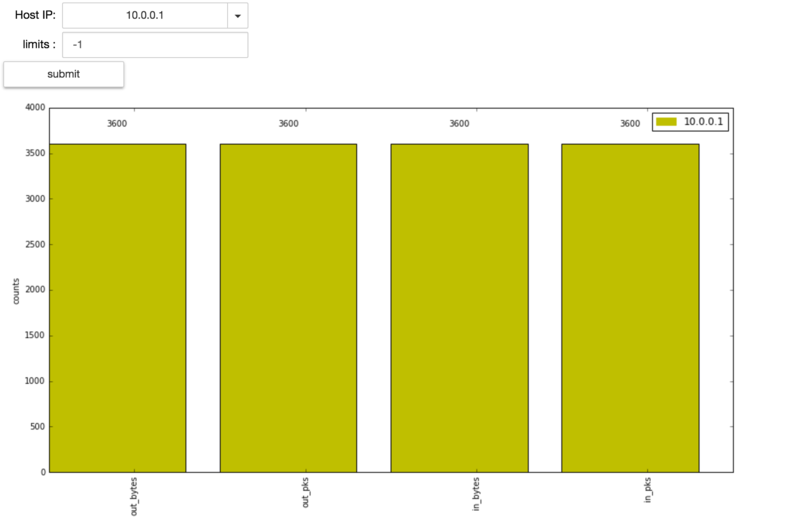 Alternatively you can simply run "Example 1: Generator sample network usage datasets" cell. On completion, you should see a similar output appended under the cell. Loading data from HDFS can be done using PNDA platform libaries, see example 2 cell as below. The first line of code is required to add PNDA PNDA platform libaries to Spark context, followed by an import statement. In this case, we use JsonDataHandler implementation that was designed to process rawdata encoded in JSON format. Finally instantiate a JsonDataHandler instance by injecting Spark Context instance, data source name, and relative file path in HDFS. Highlight the cell below "Example 2: Create an instance of JsonDataHandler" and run. RDD can be created automatically using PNDA platform library. This allows data exploration using low-level RDD APIs. When finished, data should be loaded as a RDD. You can then perform simple data transformation and action using low-level RDD APIs. 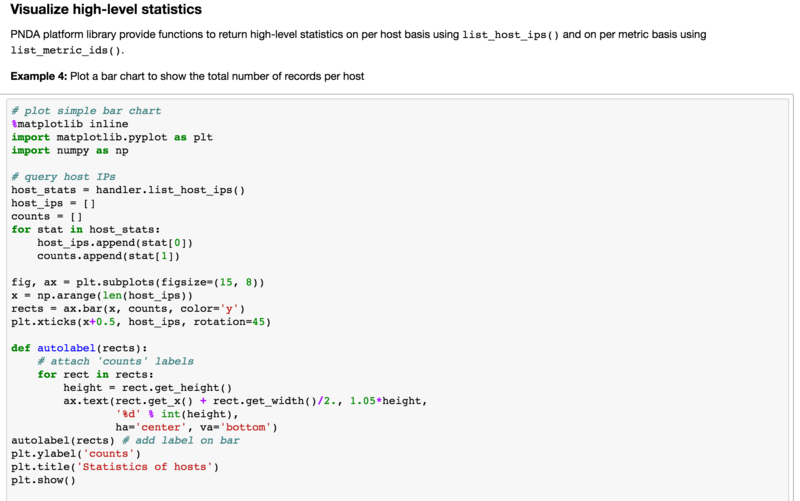 Example 3 provided some basic operations that allow you to get an insight of the example datasets. Highlight the cell below "Example 3: Simple RDD operations" and run. On completion, you should get a pending output as below, which prints the total number of records, the first record, and the unique list of monitored host ips. In this section, we will learn how to use PNDA platform libaries and matplotlib to visualize datasets. Example 4 gives an example usage of list_host_ip() API, which returns a list of ("host_ip", "total number of records") pairs. 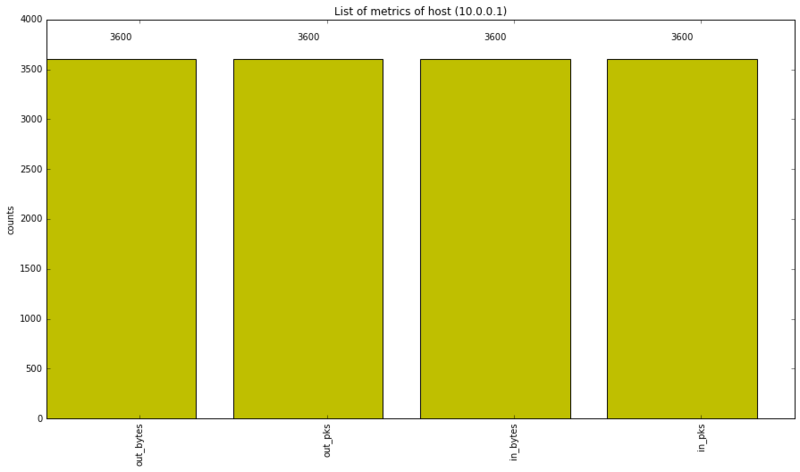 The output is plotted as a bar chart. As the sample data are equally generated on per second, per host basis, all bars are of the same height. This section showed how to use interactive widgets to build interactive visualizations. Example 5 fulfill the similar logic as Challenge 2, but in an interactive way. 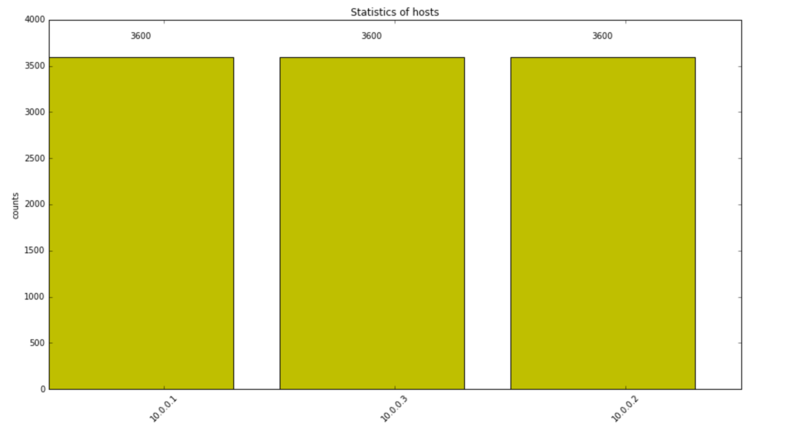 Highlight the cell below "Example 5: Interactive visualization of total number of records per metric of a particular host" and run. You should notice there are not outputs appended as previous examples. Instead an interactive UI is displayed. Click the "Host IP:" dropdown UI and select a host ip, set limit (number of metrics to be return; set minus value meaning no limit), and click the submit button. You should see a plot generated as below. Plot can be different depending on your inputs. 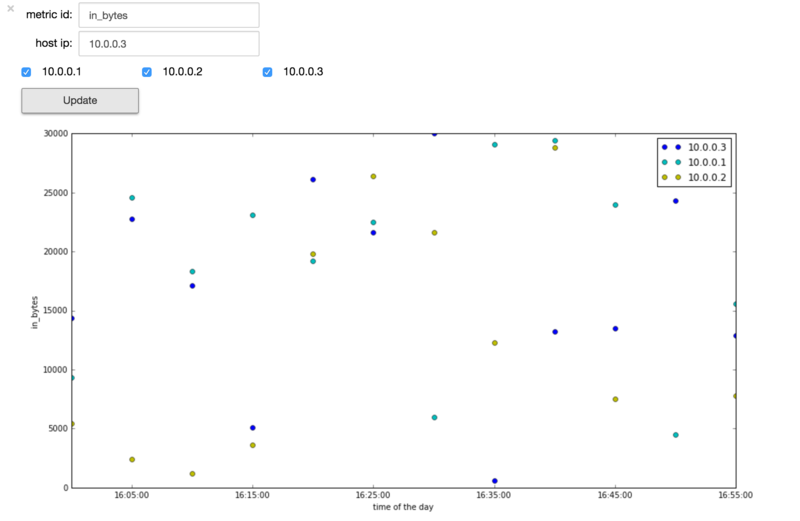 Example 6 is an another interactive visualization example to plot time-series data via the general query interface, execute_query(). Highlight the cell below "Example 6" and click run. You should see three UI elements displayed as below. Type a metric (e.g. in_bytes) you would like compare across hosts in the "metric id" text input widget. In the "host ip" input widget, type a host ip (e.g. 10.0.0.1) and click "enter". You should be able to see an option displayed. Retyping and click to include all hosts. When finished, you can now click update button and get a scattered chart as blow. This example showed how to use Jupyter to interactively find out traffic blackhole of a network. Now go on with Challenge 3 and find out packet/bytes drops of a particular host. Solution to challenge 3 can be found from the Solutions section. Copy and paste solutions to specific Challenge cell in the example notebook and run.